The Northampton Arts Council has set an October 15th deadline for applications from organizations, schools and individuals for grants that support cultural activities in the community. According to Council spokesperson Brian Foote, these grants can support a variety of artistic projects and activities in Northampton, Florence, and Leeds, including exhibits, writings, festivals, field trips, short-term artist residencies or performances in schools, workshops and lectures. The Northampton Arts Council will hold open office hours at their location at 240 Main Street, Memorial Hall Room #5 Northampton, MA 01060 on Wednesday October 8th from 6:00 PM – 9:00 PM for any potential applicants looking for advice on the application process. The Northampton Arts Council is part of a network of 329 Local Cultural Councils serving all 351 cities and towns in the Commonwealth. The LCC Program is the largest grassroots cultural funding network in the nation, supporting thousands of community-based projects in the arts, sciences and humanities every year. The state legislature provides an annual appropriation to the Massachusetts Cultural Council, a state agency, which then allocates funds to each community. This year, the Northampton Arts Council will distribute up to $10,592 in grants. Previously funded projects include: $750 to Historic Northampton for Fast Forward: New Filmmakers at Historic Northampton. $1000 to Donnabelle Casis for Florence Night Out. $750 to Serious Play! for "For Colored Girls Who Have Considered Suicide When the Rainbow is Enuf." $700 to Jennifer Polins for Catalyst Dancers, celebrating PVPA’s Catalyst Dancer’s 16th performance season. For specific guidelines and complete information on the Northampton Arts Council please visit http://www.northamptonartscouncil.org/ or contact Brian Foote at (413) 587-1069/arts@northamptonma.gov. 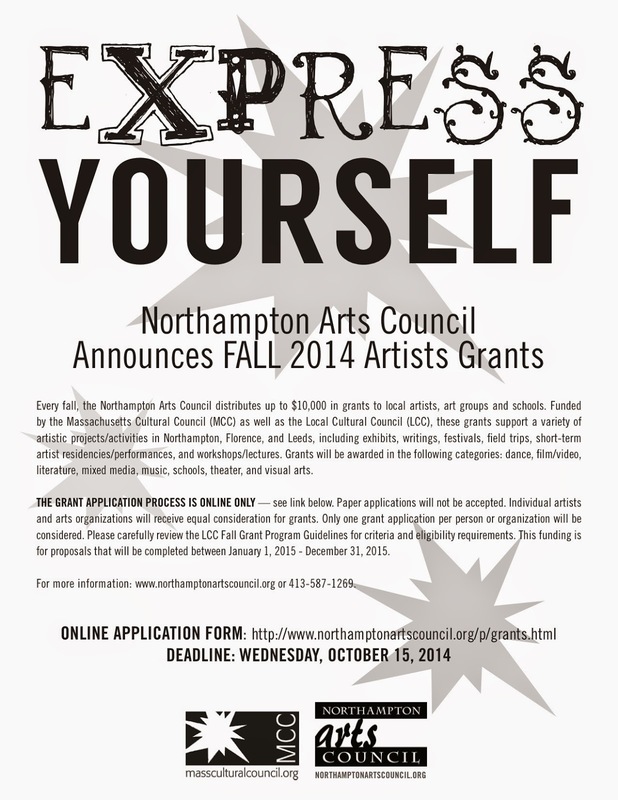 Application forms will be available online beginning September 15th at http://www.northamptonartscouncil.org/p/grants.html. This year the application process will be online only. Please do not submit paper applications. Founded in 1980, the Northampton Arts Council has an all-volunteer board, appointed by the Mayor, and staff, consisting of one director, one part-time arts events producer, and one student intern. Each fall, the Massachusetts Cultural Council (MCC), a state agency, allocates money to all of Massachusetts' 351 cities and towns through 329 Local Cultural Councils (LCCs), one of which is the Northampton Arts Council, in support of community arts activities. This is the largest decentralized program of its kind in the United States. In addition to administering the LCC program, we were the first cultural council in the Commonwealth to raise money for a second round of funding every spring, with only a few other LCCs recently following our lead. The Arts EZ Spring Grant round is made possible by two major fundraising events produced by the Northampton Arts Council: Transperformance, an end-of-summer concert at Look Park held every August, and the Four Sundays in February series which includes events such as the Silver Chord Bowl and the Really Big Show. In addition to grant programs, the Northampton Arts Council offers arts enrichment programs in the public schools, initiates public art projects and advocates for the arts in the city. For more information please visit our website: http://northamptonartscouncil.org. Moma Baby God at Smith College!